Everyone wishes we could trust everyone. Truth is it’s literally impossible. There will always be that one person that will try to test the system. There is honestly no better feeling then to see criminals fail. Harsh? Yes. Wrong? No. Protect your company’s products and high price items by having a special formulated custom destructible labels on your products that cannot be transferred or removed without the evidence that they have been tampered with. deSIGNery Signs also specializes in "Voidable Chrome Stickers" Click here for more info. Check out our Spring Sale for savings on Custom Destructible labels and Tamper Evident Stickers in the following link. BBB Member since 2004 with a proven record of complaint free customer satisfaction on items like Custom Destructible labels. Click on the BBB logo above to check our record or leave a customer review. If you are in the market for Tamper Evident Stickers, give us a call today and you will soon realize why after 24 years we still have an A+ BBB rating! At deSIGNerySigns.com we have more than 24 years experience in designs for our Tamper Evident Stickers. Call us today and let our design specialists help create your next project to promote your product or business. FREE Shipping on all decal and sticker products | Free layout | A+ BBB rating | 24 years in the business | Call Today for a free quote on Tamper Evident Stickers. 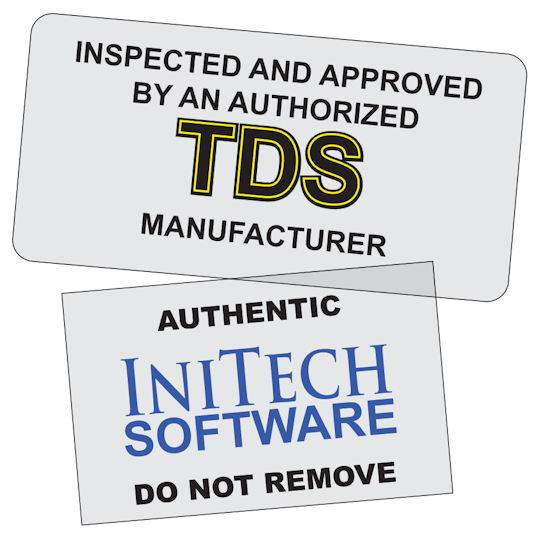 deSIGNery introduces our top quality Tamper-evident Destructible Labels & Decals, available in white and clear vinyl. Custom destructible labels can be used by anyone for anything. They are great for electronics that have been inspected, guaranteed, warranty specific items, authentically programmed computers and serviced machines. Although destructible stickers are indeed self destructing, they are also very intricate. These stickers need at least a full 72 hours to completely secure their adhesive to the surface they were applied to. This is a period in which the adhesive needs to cure so that when the sticker is tampered with, it won’t just be easily peeled off. This period is very critical and the item it is applied to should be watched closely. A few companies that would find custom tamper evident stickers useful would be larger businesses that operate in an office. There are so many items that have working parts that have to be inspected, serviced, and followed through on warranties. It is important that the destructible stickers are placed in a visible area for employees, visitors and technicians to see. Some of these items that the tear off stickers can be used on would be printers, copy machines, computers, fax machines, large machine equipment and many more. 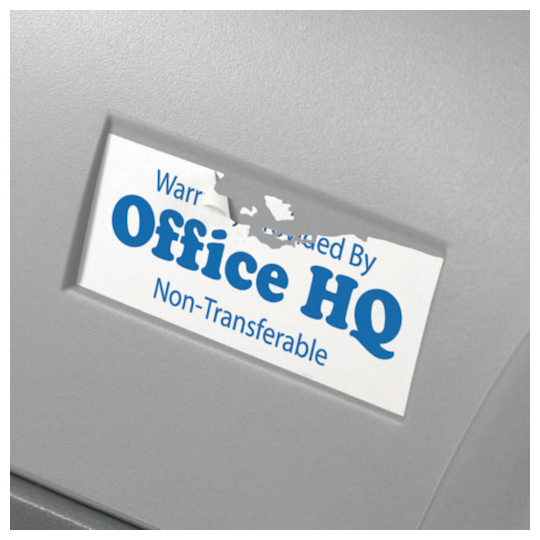 Protect your office equipment with custom tamper-evident destructible white and clear vinyl stickers, offered with many options and competitive pricing. If you are curious about this product and if it is a good investment for your business, contact us immediately for your free sample of our high quality destructible vinyl decals. All of our samples are from overruns of other orders and can even maybe give you a different idea on what you can use the tear off sticker on. Visit us on our contact us page for your free sample request and while you are there, send in a request for a free quote. Our friendly and talented staff will provide you with the highest level of customer service and will offer professional advice without hesitation. We want you to feel fully comfortable in the Tamper-Evident Destructible Stickers that you are going to purchase.